This was an exceptionally quick lunch to pack, since it was just leftovers from one of The Kid's favorite meals the night before. I cooked an extra turkey burger at dinner and saved some sweet potato fries, which he is perfectly happy to eat cold. (I don't understand his liking for cold fries, but am perfectly willing to take advantage of it!) After spreading the bun with dairy free margarine, I grilled it on the skillet, which, in addition to being tasty and fattening, helps keep the bun from getting soggy. It was then spread with ketchup, The Kid's only condiment of choice. After cutting it in half, I wedged it into the lunchbox. 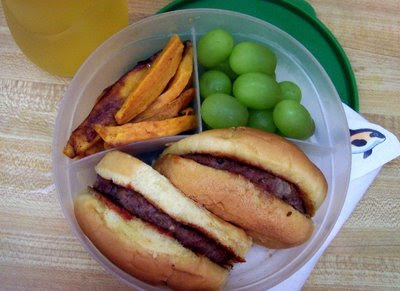 The burger and fries are accompanied by grapes, a bottle of apple juice mixed with water and a dolphin sticker. The lunch does not include any ketchup for dipping, even though The Kid would drink it straight from the bottle if I let him. I've learned that anything that requires him to open additional containers or needs assembly demands more time and concentration than my five year old has available in the noisy school cafeteria. This lunch is being sent to Margo at Coffee and Vanilla for February's Wholesome Lunchbox event. Don't miss all the great lunches she posts every month on the fifteenth! love the turkey burger idea. where do you get those snazzy lunchboxes?? i'd love to get them for my own kids! what brand of dairy free margarine do you use? I've only found one brand, Fleishman's low salt. But it's not always carried in the regular grocery stores. Is this a food allergy? Free video library explains all. Mary-I use Earth Balance, both the spreadable and sticks. My grocery store carries the tubs, but I have to go to the health food store to get margarine for baking. What kind of turkey burgers do you use/make?